is the foundational text of Daoism and a primary source of modern Chinese ideas about life and politics. Johnson, 1980, 1999; Lakoff & Turner, 1989). Chinese classics (Garrett, 1993a, 1993b; Lu, 1994; Ma, 2000). 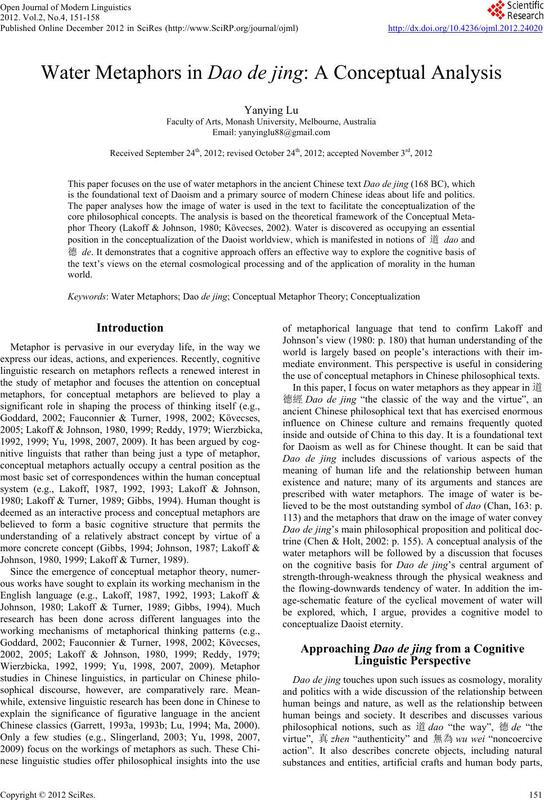 the use of conceptual metaphors in Chinese philosophical texts. lieved to be the most outstanding symbol of dao (Chan, 163: p.
through cross-domain mappings and metaphorical entailment. domain mapping and metaphorical entailment. water-based metaphors that have dao as the target concept. is that they are good at stay ing lower than them. As for the process of dao, it is ever so indefinite and vague. Though vague and indefinite, there are images within it. Returning is how dao moves; weakening is how dao functions. 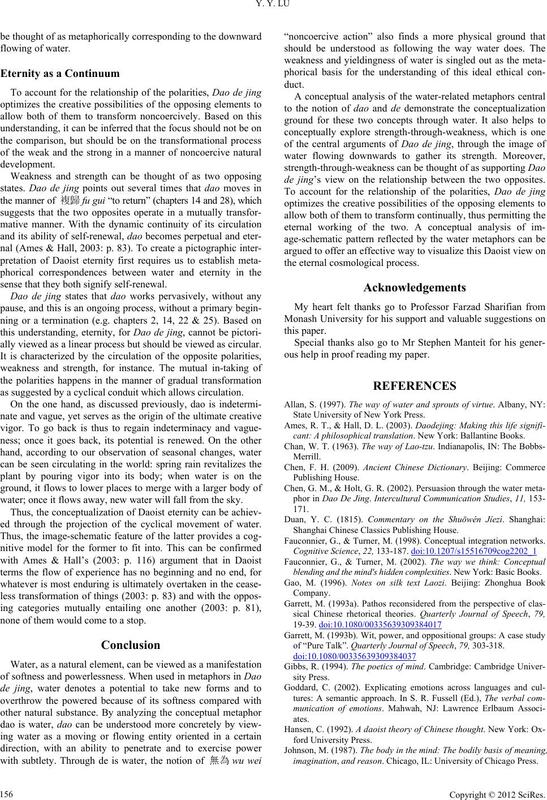 dao in Dao de jing are described in terms of those of water. suggest, is mapped onto dao’s formless feature (example 6). Dao flows ea s ily which can run in any direction. Dao is the pouring together of all things . things, as metaphorically indicated by 注zhu “pour”. water, which appears to be weak and gentle. of water and the movement of dao. reaches of water’s downward flow. manifested in the image of flowing wate r.
Dao being empty , the use of it ca n n ot be filled up . So deep, it only seems to persi st.
used as an adjective, it describes the depth of a pool of water. characterized by its depth3 (e.g. chapter 36). 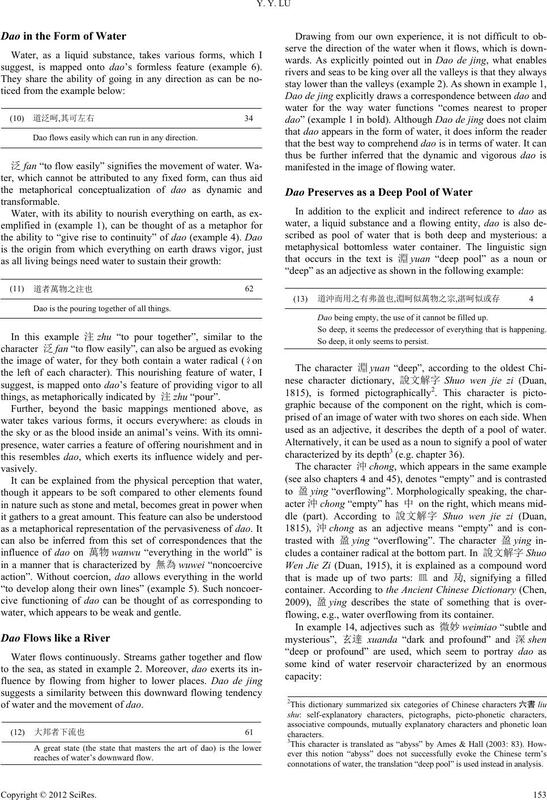 flowing, e.g., water overflowing from its container. 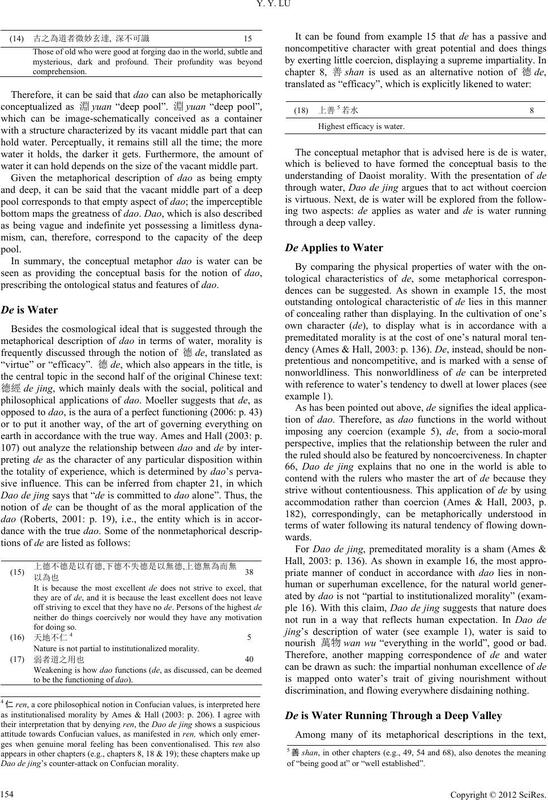 connotations of water, the translation “deep pool” is used instead in analysis. water it can hold depends on the size of the vacant middle part. prescribing the ontological status and features of dao. earth in accordance with the true way. Ames and Hall (2003: p.
Nature is not partial to institutionalized morality. to be the functioning of dao). 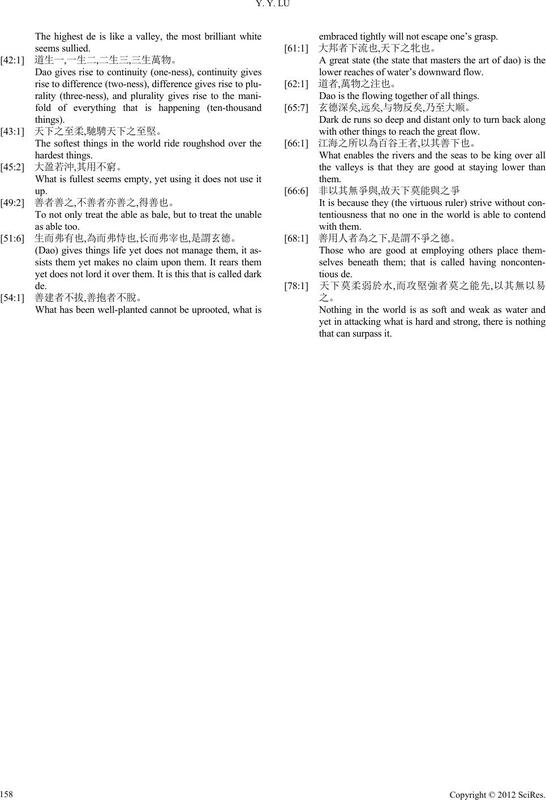 accommodation rather than coercion (Ames & Hall, 2003, p.
nourish 萬物 wan wu “everything in the world”, good or bad. discrimination, and flowing everywhere disdaining nothing. ao de jing’s counter-attack on Confucian mora lit y.
of “being good at” or “well established”. other things to reach the great flow. As a valley to the world, your constant de will be ample. regarded as corresponding to de’s noncoercive character. elements to allow both of them to transform noncoercively. 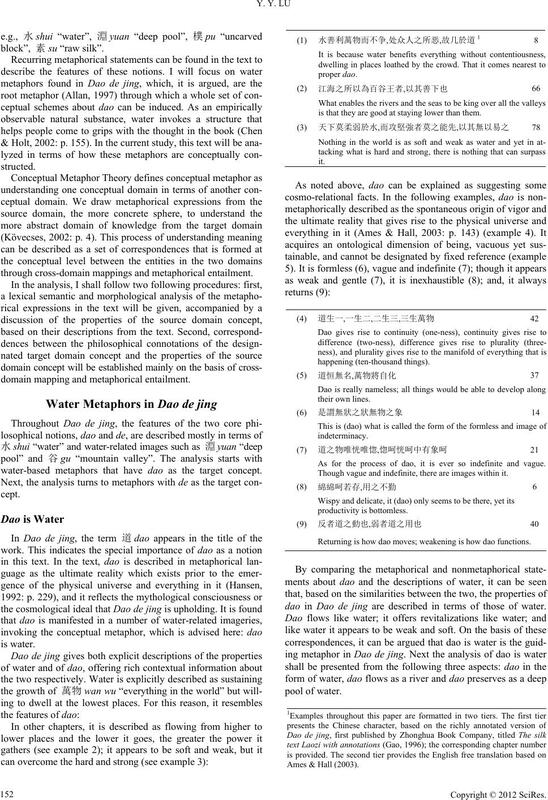 nitive model to conceptualize Daoist eternity. noncoercive sense is what they share in common. grow inside or run through it. and ultimately will defeat the strong and the hard. metaphorically represent the noncoercive application of de. sense that they both signify self-renewal. ally viewed as a linear process but should be viewed as circular. as suggested by a cyclical conduit which allows circulation. water; once it flows away, new water will fall from the sky. ed through the projection of the cyclical movement of water. none of them would come to a stop. de jing’s view on the relationship between the two opposites. ous help in proof reading my paper. cant: A philosophical translation. New York: Ballantine Books. Shanghai Chinese Classics Publishi ng House. Fauconnier, G., & Turner, M. (1998). Conceptual integration networks. blending and the mind's hidden complexities. New York: Basic Books. of “Pure Talk”. Quarterly Journal of Speech, 79, 303-31 8.
imagination, and reason. C hicago, IL: University of Chicago Pre ss. and thought. Cambridge: Cambridge University Press. MA: Belknap Press of Harvard Univ ersity Press. bridge: Cambridge Univer sit y Press. from Chinese. Amsterdam: John Benjamins. to poetic metaphor. Chicago, I L: Univer s ity of Chicago Press. Yu, N. (2007). 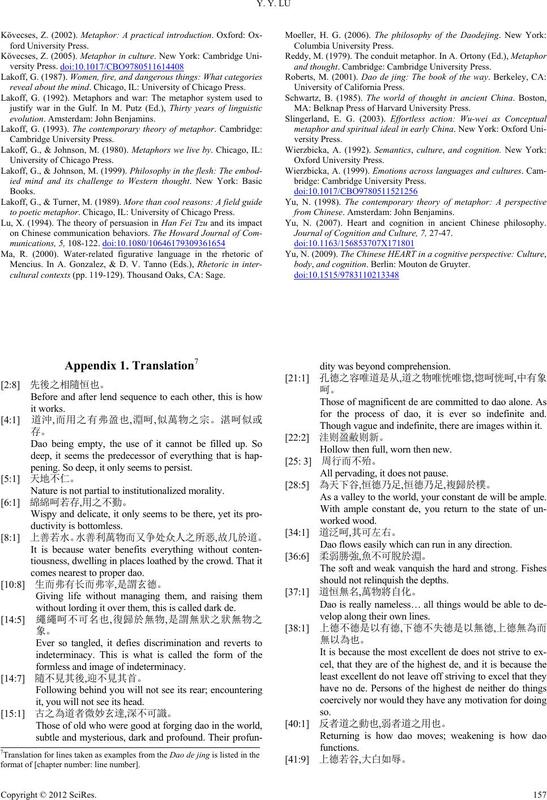 Heart and cognition in ancient Chinese philosophy. Journal of Cognition and Culture, 7, 27- 47.
body, and cognition. Berlin: Mouton de Gruyter. cultural contexts (pp. 119-129) . Thousand Oaks, CA: Sage. pening. So deep, it only seems to persist. comes nearest to proper dao. without lording it over them, this is called dark de. formless and image of indeterminacy. it, you will not see its head. for the process of dao, it is ever so indefinite and. Hollow then full, worn then new. All pervading, it does not pause. Dao flows easily which can run in any direction. should not relinquish the depths. velop along their own lines. embraced tightly will not escape one’s grasp. lower reaches of water’s downward flow. Dao is the flowing together of all things. with other things to reach the great flow.